The mum behind the viral video where a 6-month-old is struggling to swim is now fighting back against her critics. Many thought that Keri Morrison’s method was extreme. But there is a good reason behind why she wants to train her child to get used to swimming at an early age. Following the tragic death of her 2 1/2-year-old son Jake due to drowning, Keri became determined to protect her daughter Josie from suffering a similar fate. Though not all moms may agree with her, the technique she uses is actually a legitimate method. 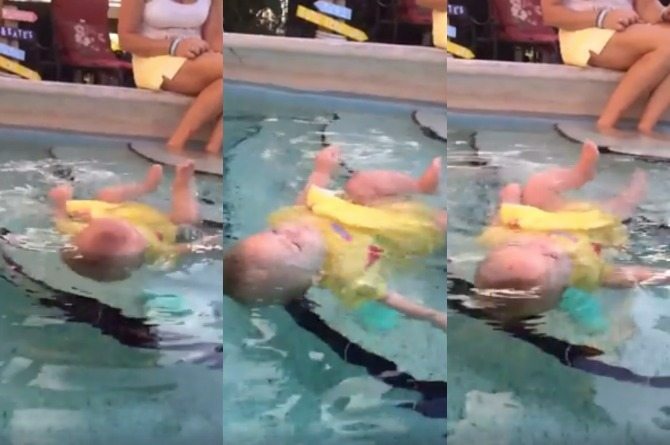 This technique is called Infant Swimming Resource (ISR). It is a way of teaching children and even babies (as young as 6 months old) how to “self-rescue”. In the viral video, 6-month-old Josie’s attention is grabbed a tiny sandal. Attempting to reach for it, she flops face first into the water but manages to flip around to her back, successfully pulling off a “self-rescue” technique. A source close to the couple told E! News confirmed that Ozzy and Sharon Osbourne have gone their separate ways after more than three decades together. The source explained that the 67-year-old rock icon and 63-year-old TV host came to a mutual agreement to move out of their home. The two tied the knot back in 1982 and have two kids together: Kelly and Jack, both of whom now have their own families. The two met when Sharon was just 18; they were introduced by Sharon’s rock band manager dad, Don Arden. But thoughts of divorce have been swirling in Sharon’s mind as constant tension brewed beneath the surface. Sharon penned an autobiography entitled ‘Unbreakable’ in 2013 in which she calls their 30th anniversary “one of the worst periods” in their marriage. She had just discovered he had relapsed and was sucked into his longtime battle with drug and alcohol addiction after years of being able to stay sober. As of this writing, no final confirmation has been released by the couple themselves. After learning about the death of their teacher’s cat–who had been with their teacher for 16 years–a group of thoughtful students came up with a brilliant idea to cheer her up. The big surprise? Two new baby kittens to care for. The entire sweet surprise was captured on video and is currently going viral. Aside from the cute kittens, they showed their love for their teacher by bringing her balloons, flowers, and cupcakes. Mrs. Andrews was overwhelmed when her students at Joshua High School came out bearing treats and their special fluffy, adorable gifts. She broke down in tears, unable to contain the joy she felt because of the touching gesture. “Are they mine?” she asks her teenage students, incredulous, as she holds both her new kittens close to her.